Lord & Berry SCUBA Waterproof Mascara in #1390 Black, 8 ml (£10.00 at Lookfantastic): I received this in a Love Me Beauty Box and was pretty excited, as it nearly is the retail cost of the entire subscription and I always love trying a new mascara. I liked it at first, but it got extremely smudgy and probably only lasted one or two months. Apparently there was an issue with the product and Love Me Beauty compensated its subscribers with a full-sized lipstick in a later box. I would guess that it was an issue with the formula, so I can't really attest to whether it worked or not. £10 is more than I would usually spend on a mascara so I probably wouldn't repurchase. I have also ceased use of waterproof mascaras so this wouldn't fit the bill for me, unfortunately. Neutrogena Healthy Skin Glow Sheers SPF 30 oil-free Foundation in 10 Ivory to Fair, 32 ml ($10.99 at ULTA): This was a gift from my mom, I forgot a base for my plane ride over. It looked really great on her and really worked well to even out my skin. 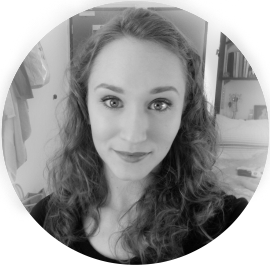 In the summer my skin has an overall even tone with redness and a few dry patches. It was very hydrating. I wouldn't recommend it to anyone with oily skin as it may be too greasy. As I became paler this shade didn't suit me that well, even though it is the lightest, and began to pill on my skin. Lo and behold it expired in August 2012, oops. I do think this is a great, lightweight tinted-moisturizer-esque option for those who like light coverage and want sunscreen protection in their makeup. I would like to repurchase at some point to see what the product is actually like. e.l.f. Professional Bronzing Brush (£1.50 at eyeslipsface.co.uk): This is a great angled brush for blush, bronzing and contouring but unfortunately doesn't hold up through washes for very long. I tossed this when it started shedding and have found a Superdrug brush that I like better, for now. You can't beat the price but if you find yourself purchasing ten times you might want to invest in a brush that will hold up better in washing and not shed on your face. The ends of the fibers don't hold up well, either. Revlon ColorStay Liquid Eye Pen in 01 Blackest Black, 1.6 ml (£6.99 at Superdrug): Oh, the liner pen. This was the first liner pen that helped me perfect my cat eye throughout the summer of 2013. Before that I had used flaky liquid liner brush formulas, but oh how easy the pen is! I like this liner a lot, until it started to dry up. I didn't repurchase because I wanted to play the liner field, but I have to say this is the best I've tried so far and I'm missing it! The point is precise but dense, so there is a lot of control available. Good stuff. Soap & Glory Wish Upon A Jar Peptide Plus Rejuvenating Night Cream, 45ml (£16.00 at Boots): Nope. Just nope. I credit this product with giving me the worst clogged pores of my life. First off, this cream is extremely thick and heavy. It doesn't absorb in the morning. It just sits there. Now, it smells lovely. I was so excited about this at first because it is probably one of the most expensive moisturizers I've owned, Soap & Glory is extremely novel to me as an American in the UK, the product comes in this amazing chrome globe, and it smells like an orange cream dreamsicle. Straight up. However, as a person with slightly sensitive skin, this was killer fragrance for my poor face and I had redness and stinging most nights that I used this, especially if I used a harsh cleanser. I don't know if I would recommend this for anyone, and I haven't heard any reviews, positive or negative, so that's your sign. Shiseido Bio-Performance Advanced Super Revitalizing Cream 7ml sample (50ml for £78.50 at John Lewis): This was a good night cream, I'll tell you that. It was almost like a balm, it's a very dense cream. It didn't feel greasy and was nice to use, although some nights while I was using this I would opt out for something lighter to let my skin breathe. I wouldn't repurchase because it is SO expensive and I didn't see any major results (though I didn't use it for a month because of the sample size), but if it is in your budget I'd recommend it. Last thing! It smells like an old lady at church. Yep. That is a little worrying for me, but it never made my skin sting so I kept with it. Pond's Luminous Moisture Day Lotion with SPF 15, 50 ml ($4.67 at Walmart.com): This was a nice daytime moisturizer with SPF for me. 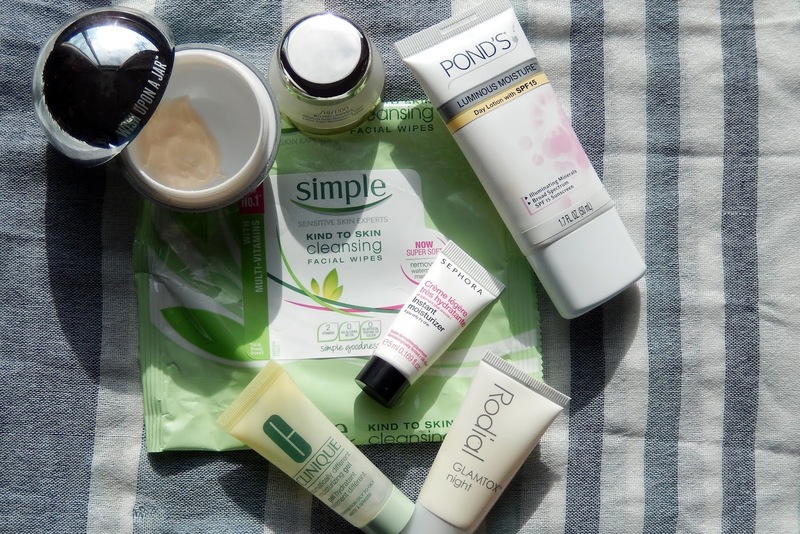 I felt it was nice and hydrating for dry skin, although Paula's Choice Beautypedia rated it poorly because it wasn't hydrating enough and had a funky preservative. The formula includes mica which makes the light bounce off of your skin to provide a cosmetic luminous glow. Overall, this was an average, light moisturizer that I enjoyed using. I want to try a few products out before I think about repurchasing, but if I was ever in a pinch (say, travelling) and need to jaunt to Walmart for a day-cream I know this one would work fine for me. It lasted me pretty much all of summer, autumn and winter so it goes really far, which is a plus! Rodial Glamtox Night 15 ml sample (30 ml for £90 at John Lewis): You can read my review here with my thoughts on the Glamtox Night product. I loved the way it felt and how my skin looked after using it, although some nights it did sting a little if I was harsh on my skin during cleansing. I wouldn't repurchase this because it is so expensive, but am looking into other retinol products and chemical exfoliants to keep my skin fresh. Clinique Dramatically Different Moisturizing Gel for Combination Oily to Oily Skin, 15 ml sample (50ml for £17 at Boots): So, I used this sample moisturizer after Christmas while traveling and I was wondering why it made my skin feel tight and why my skin stung after using even the creamiest of cleansers. This is NOT for dry/normal/combo skin. I am nowhere near the oily spectrum so this really doesn't work for me. Will not repurchase. I have heard good things about the Clinique Dramatically Different + but I have a while until I will need a day cream. Simple Sensitive Skin Experts Kind to Skin Cleansing Facial Wipes, 25 wipes (£1.99 at Superdrug): Meh. I didn't really like this. I don't use face wipes a whole lot because of Caroline Hirons's advice and because they are scratchy and make my face red. I never use them as makeup removers as suggested, just as a once over if I didn't put any makeup on, if I'm lazy, or if I'm traveling. This is probably my second or third pack just because I am a creature of habit, but I don't like how rough the wipes feel on my skin. I purchased Superdrug's Vitamin E Face Wipes and though they aren't entirely smooth, I do like them better than these. The package advertises both that it is super soft and that it removes waterproof mascara. It is not super soft and you would need a lot of these guys to remove waterproof makeup thoroughly. Sephora Collection Instant Moisturizer, 5ml sample (30 ml for $12.00 at Sephora): This felt really nourishing and hydrating on my skin. It wasn't really exciting, but it didn't irritate my skin. It's a basic, safe moisturizer in my book. I wouldn't repurchase because I know I can find more inexpensive safe basic moisturizers such as Pond's Luminous Moisture Day Lotion. I feel like this product gives more surface moisture than deep-down hydration. 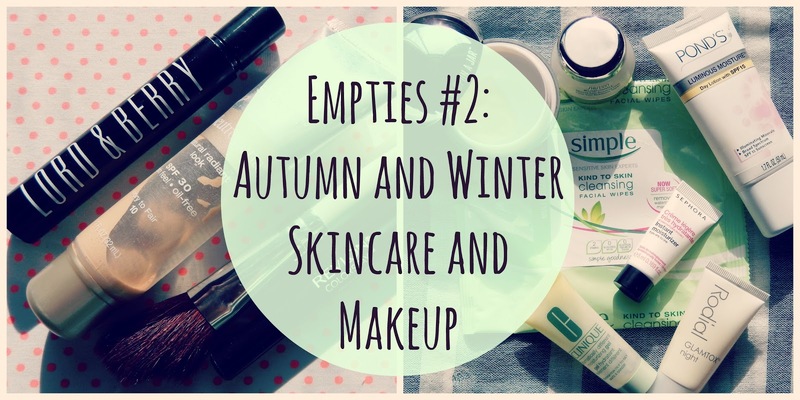 That's it for my autumn and winter makeup and skincare empties! I had a lot of fun putting this together and hope you find these reviews helpful. Let me know in the comments what products you've used up or if you've tried some of the same products!